For a new take on the oft-told mythological character, we head to 2014’s Hercules. In a prologue, we learn of the super-human nature of Hercules, the spawn of the god Zeus and a human woman named Alcmene (Karolina Szymczak). Or maybe not, as the story immediately sets up the notion that this tale exists solely to soften up/scare foes. Hercules works with a band of mercenaries who roam the land and take on fights for hire. A princess named Ergenia (Rebecca Ferguson) finds Hercules and tells him her father Lord Cotys (John Hurt) needs his services. This leads Hercules and company to Thrace, where they will train an army. We follow these adventures as well as elements that reflect on what led Hercules to his current situation. Due to his physique, Johnson winds up in a lot of action roles, but I don’t think these show off his talents consistently. I don’t think he’s a good actor a broad sense, as I don’t feel he can pull off dramatic parts especially well. As demonstrated in a mix of lighter efforts, Johnson can do comedy, but when asked to take on something more serious, he tends to falter. That becomes a bit of an issue when we need to dig into Hercules’ emotional side and haunted past, as Johnson can’t muster the necessary gravitas. However, he manages to handle the action scenes well and he provides ample heroic punch. Johnson boasts natural charisma that comes through in the role and helps allow us to better engage in the story. Best known for the Rush Hour films, director Brett Ratner does nothing to harm Hercules, but he also doesn’t bring the film to a higher level. When I reviewed 2006’s X-Men: The Last Stand, I opined that Ratner never seems inspired or impressive behind the camera, and that statement remains true eight years later. Actually, I probably could’ve just cut and pasted much of my Last Stand review and used it here, as a lot of it still applies – especially in areas related directly to Ratner. Like Last Stand, I feel pleased that Hercules refrains from the use of the cheap, tacky humor Ratner seemed to adore in the Rush Hour movies. Hercules comes with some light moments but these avoid the lowest common denominator feel of Ratner’s other work. Even the film’s one use of the “f-word” – produced for comedic effect – doesn’t seem too painful, even if it does appear out of place in the movie’s world. As was the case with Last Stand, Hercules best comes to life during its action scenes, and that happens mainly because the story itself doesn’t reinvent many wheels. Actually, I do give Hercules credit for its attempts to broaden the legend. For one, it keeps the fantasy side of things on the sideline and up for interpretation. Normally the tale asks the audience to accept the notion of gods and mythological creatures, but this film allows for alternate interpretations, and I think that creates a neat change. Hercules also manages a few twists in terms of its main narrative. For much of the film, manners unfold in a pretty standard Seven Samurai, but the plot delivers a handful of curveballs as it progresses. None of these truly shock or startle, as even with the “surprises”, the movie flows down a fairly predictable stream. Still, these elements manage to make a potentially flat narrative more interesting, so I appreciate the changes. Really, I find it hard to pin down anything about Hercules that impresses, as much of the movie comes across as standard action fare. Nonetheless, it ends up as entertaining standard action fare, so expect a breezy, reasonably exciting fable. Hercules appears in an aspect ratio of approximately 2.40:1 on this Blu-ray Disc. As expected, the image looked terrific. Sharpness seemed positive. Virtually no softness marred the presentation, so the flick came across as well-defined and accurate. I saw no signs of jagged edges or shimmering, and edge enhancement seemed absent. Print flaws also never reared their ugly head, as the movie seemed clean at all times. Colors varied dependent on the setting. While much of the movie opted for an arid amber tone, battle sequences favored a strong teal bent. Within those parameters, the hues looked positive. Blacks seemed dense and firm, while low-light shots presented good clarity and visibility. The image proved to be pleasing. I also felt pleased with the DTS-HD MA 7.1 soundtrack of Hercules, as the soundfield appeared active and involving. All the channels presented lots of material that kept the viewer at the center of a realistic and immersive world. Elements seemed appropriately placed and they blended together well. Not surprisingly, battle sequences were the most impressive, but the entire package seemed strong. Audio quality equaled the positive nature of the soundfield. Speech was natural and distinctive, and I detected no issues connected to intelligibility or edginess. Music sounded bright and vibrant, as the score presented rich and full tones. Effects came across as accurate and concise. No problems with distortion appeared, and these elements were clean and broad. Bass response seemed excellent. I found much to like in the soundtrack of Hercules. The Blu-ray includes both the film’s theatrical version (1:38:04) as well as an extended cut (1:41:35). 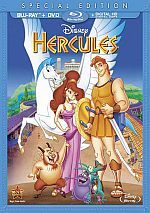 Because the Blu-ray represented my initial screening of Hercules, I can’t relate the nature of the added content, but I wanted to mention that two editions appear here. Alongside the theatrical version, we find an audio commentary from director Brett Ratner and producer Beau Flynn. Both sit together for this running, screen-specific look at story/character areas, cast and performances, sets and locations, visual design and effects, music, editing and connected domains. While Ratner and Flynn give us occasional nuggets of information, they devote much of the track to praise for the film and all involved. This piece becomes a major lovefest and lacks much in the way of compelling facts. It’s not a bad listen anyway, but it disappoints. 15 Deleted/Extended Scenes fill a total of 14 minutes, 38 seconds. For the most part, these add to supporting characters, and they extend some situations like battle training. None of them appear crucial, but they add some interesting moments. A few featurettes flesh out the set. Brett Ratner and Dwayne Johnson: An Introduction goes for five minutes, 38 seconds and includes notes from Ratner and actor Dwayne Johnson. They discuss the movie’s path to the screen, Johnson’s casting, training and performance. We get a few decent notes about how Johnson’s injuries affected production, but this is mostly a fluffy piece. 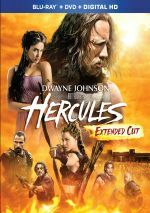 During the 11-minute, seven-second Hercules and His Mercenaries, we hear from Johnson, Ratner, stunt coordinator/fight coordinator Allan Poppleton, archery instructor Stephen Ralphs, and actors Aksel Hennie, Ian McShane, Ingrid Bolso Berdal, Reece Ritchie, Rufus Sewell, and Rebecca Ferguson. The featurette covers cast, characters and performances. Like the last program, this one lacks much depth, but it gives us some decent glimpses of the supporting actors. Next comes Weapons!, a five-minute, 24-second show with notes from Ratner, Johnson, Sewell, Hennie, Ritchie, supervising armorer Tim Wildgoose. Here we learn about the different weapons used by the film’s characters. Once again, we get a superficial but moderately interesting show. The Bessi Battle runs 11 minutes, 54 seconds and includes Ratner, Flynn, Sewell, McShane, Hennie, Poppleton, Berdal, Johnson, military advisor Paul Hornsby, costume designer Jany Temime, production designer Jean Vincent Puzos, set decorator Tina Jones, special effects supervisor Neil Corbould, prosthetics supervisor Conor O’Sullivan, supervising stunt coordinator Greg Powell and actors Stephen Peacocke and Ian Whyte. This featurette examines elements related to the movie’s big war scene. The show touches on a lot of bases and delivers an enjoyable take on the topics. Finally, The Effects of Hercules takes up 12 minutes, 28 seconds with info from Ratner, Johnson, Powell, Corbould, visual effects supervisor John Bruno and actor John Hurt. We learn about various visual and practical effects used through the film. This turns into a satisfying liitle piece. 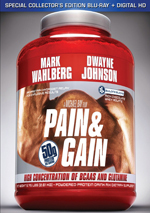 The package also includes a DVD copy of Hercules. It provides none of the Blu-ray’s extras. With 2014’s Hercules<, we get a pretty good retelling of the ancient legend. While the movie doesn’t excel in any particular way, it provides brisk, likable action entertainment. The Blu-ray brings us excellent picture and audio as well as a mix of generally interesting bonus materials. As action far, Hercules provides an enjoyable experience.